I'll post up a chart of the five biggest winners in each format, and then take a more in-depth look at the biggest winner. First up then is HUSNGs, and there seems to be an incredible amount of money circulating in them. 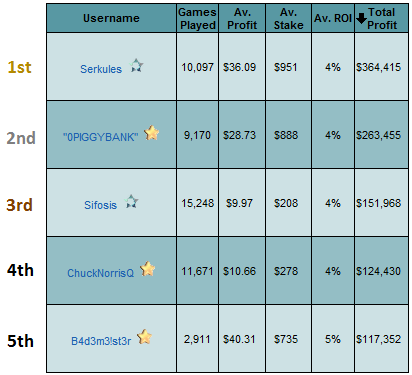 The top 5 players alone have made a combined $450,000 in Turbo HUSNGs and an incredible $900,000 in Hyper-Turbo HUSNGs. 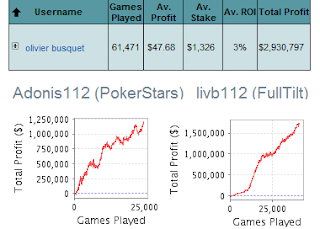 It is evident that there has been a shift over to the Hyper Turbo format since they were introduced on PokerStars in July 2011, and a majority of the Top 20 players in the "Any Game, Any Stakes" list on Sharkscope are Hyper-Turbo HUSNG players. 'Adonis112' is 31-year-old Poker Pro Olivier Busquet from New York. He is also well known as 'livb112' which was his Full Tilt username. 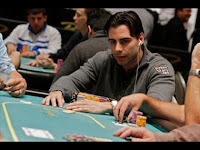 One might surmise that Busquet is pretty good at poker. For a start he has won just shy of $3 million in SNGs and tournaments since he began playing in 2006, mostly in Heads Up SNGs. Not only that, he has accrued just over $3 million in live cashes, including a victory in the 2009 WPT Borgata Poker Open for $925,000. Also, just a couple of months ago, he finished 2nd place in EPT Campione 2012 for €430,000. 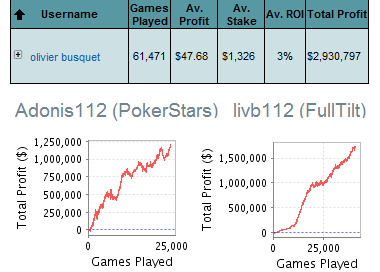 He's hasn't done too badly online this year either, as he is the biggest winner in the High Stakes Turbo HUSNGs this year. If you are interested in finding out more about Olivier Busquet, his website is here. 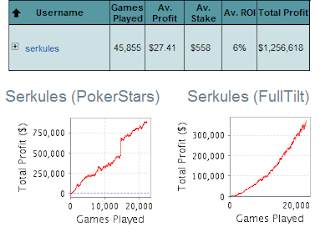 'Serkules' is a 23-year-old Poker-Pro based in Germany. 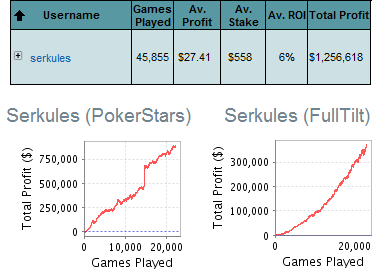 Since September 2009 he has earned $1.25 million between his PokerStars and Full Tilt Poker accounts, mostly in Hyper Turbo HUSNGs. 2012 has also been rather kind to Serkules. 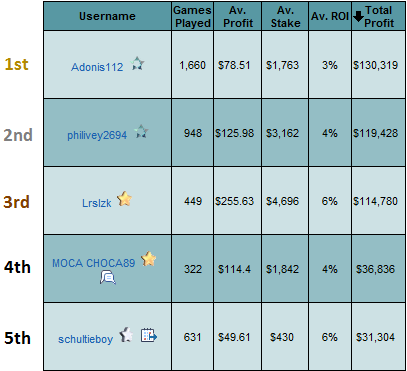 Not only is he up $365k in the first 4 months of the year, he also chopped the $2k High Roller event 4-ways in the inaugural TCOOP in January 2012, worth ~$165k. You can read a little more about Serkules here. *Bear in mind the leaderboards don't include anyone who has blocked their stats. 1 Comment to "SNG Superstars 2012 (Part 1 - HUSNGs)"
plz dont forget the fifty50. some say they are almost unbeatable.